The main process of making wheat is as follows: the barley enters the wheat straw to wash the wheat, after absorbing water, and then enters the germination box to germinate and becomes green malt. The green malt enters the drying tower/furnace to be dried, and the root is removed by the root machine to make the finished malt. It takes about 10 days from barley to malting. The main production equipment of the wheat-making process is: sieve (wind) sorting machine, classifier, permanent magnet cylinder, stone removing machine and other impurity removal and grading equipment; dip wheat trough, germination box or mashing machine, air conditioner, drying tower (furnace), wheat machine for removing root machine, etc. ; conveying and storage equipment such as bucket elevator, spiral/scraper/belt conveyor, dust collector/fan, vertical warehouse, etc. Malt, rice and other raw materials are transported from the feeding port or the vertical warehouse through the bucket elevator, screw conveyor, etc. to the top of the sugar-melting building. After the stone removal, iron removal, quantification, crushing, the raw materials enter the gelatinization pot. The saccharification pot is saccharified and decomposed into mash. Then added the hops to Liquid and boil after filtering through a filter tank / filter press, and then remove the hot coagulum by cooling separation. The malt is sent to the crushing tower before being sent to the brewing plant. The malt is lightly crushed to produce malt for brewing here. The gelatinization treatment mixes the mashed malt/grain with water in a gelatinization pot. The gelatinization pan is a huge convoluted metal container with hot water and steam inlets, mixing devices such as stir bars, paddles or propellers, and a large number of temperature and control devices. In the gelatinization pot, the malt and water boil after heating, which is a natural acid that converts the poorly soluble starch and protein into a soluble malt extract called "wort". The wort is then sent to a filtration vessel called a separation vessel. The wort is removed from the malt hull in the filter tank before being pumped into the boiling pot, and the hops and sugar are added. After boiling, the wort added to the hops is pumped into the cyclone sedimentation tank to remove unwanted hop residues and insoluble proteins. Boiling: In a boiling pot, the mixture is boiled to absorb the hops and to color and disinfect. Paste pot: Put some ingredients such as malt, rice, corn and starch into the gelatinization pot to boil at first. Saccharification tank: Add appropriate warm water to the remaining malt and add the auxiliary material boiled in the gelatinization pot. At this point, the starch in the liquid will be converted to maltose. Wort filter tank: The transparent wort (syrup) is obtained after filtering the puree in the saccharification tank. Fermenter mature tank: Beer yeast is added to the cooled wort for fermentation. The sugar in the wort is broken down into alcohol and carbon dioxide. After about a week, the "tender beer" can be produced, and then it matures after dozens of angels. Subsequently, the yeast is added to the wort and begins the process of fermentation. 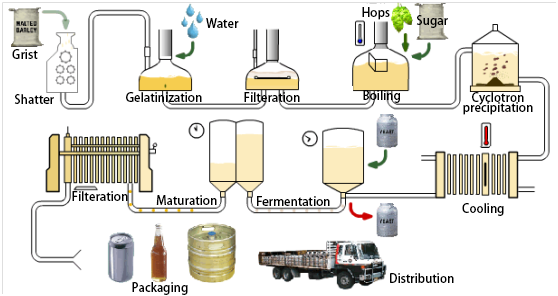 During the fermentation process, the artificially cultivated yeast converts the fermentable sugar in the wort into alcohol and carbon dioxide to produce beer. Fermentation takes place within eight hours and proceeds at an accelerated rate, accumulating a high density foam called "wrinkle". This foam reached its highest stage on the 3rd or 4th day. From the 5th day, the speed of fermentation slowed down, and the wrinkles began to spread on the surface of the wort, which must be removed. After fermenting all the fermentable substances in the wort, the yeast begins to form a thick precipitate at the bottom of the container. As the temperature gradually decreases, the fermentation is completely finished after 8 to 10 days. Strict control of temperature and pressure is required throughout the process. Of course, the difference in beer and the different production processes lead to different fermentation times. Usually, the fermentation process of the lager takes about 6 days, and the pale beer is about 5 days. After the end of the fermentation, most of the yeast settled at the bottom of the tank. The winemakers recycle the yeast for the next can. After the yeast is removed, the product "tender beer" is pumped into the post fermenter (or referred to as the ripening tank). Here, the remaining yeast and insoluble proteins are further precipitated, and the style of the beer is gradually matured. Beer filter: After the mature beer is filtered, an amber green beer is obtained. Cooling, fermentation: The cleaned wort is pumped from the cyclone sedimentation tank and sent to a heat exchanger for cooling.